Oviraptors lived in the Late Cretaceous, 80 million years ago. Oviraptors were small dinosaurs, measuring about five feet from nose to tail. Scientists know oviraptors ate reptiles, but they’re not sure what else it ate. With its sharp beak, it could crack hard things like nuts, seeds, or shellfish. Perhaps it ate those. The first Oviraptor was found in the 1920s near a nest of dinosaur eggs. Scientists thought the nest belonged to a Protoceratops. They also thought the Oviraptor, whose fossil had a crushed skull, was trying to steal the eggs when it was killed by an angry Protoceratops parent. In the 1990s, scientists discovered a similar nest of eggs with an Oviraptor on top of it. They realized that the original Oviraptor discovered 70 years before was probably trying to protect its nest, not steal another dinosaur’s eggs. Oviraptors laid as many as 20 eggs at a time. Question: How big was an Oviraptor? 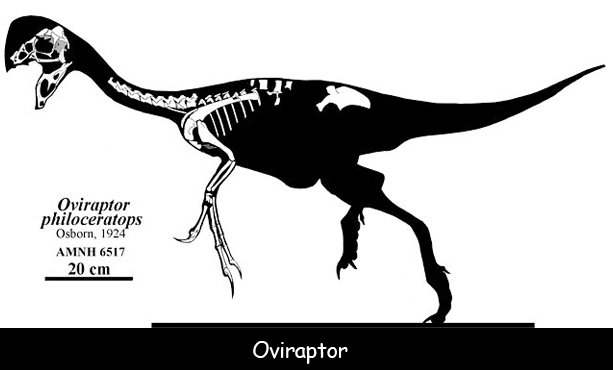 Answer: Oviraptors weighed about 75 pounds and were 8 feet long. Read more about Oviraptors here. Declan, Tobin. " Amazing Oviraptor Facts for Kids ." Easy Science for Kids, Apr 2019. Web. 21 Apr 2019. < https://easyscienceforkids.com/oviraptor/ >.